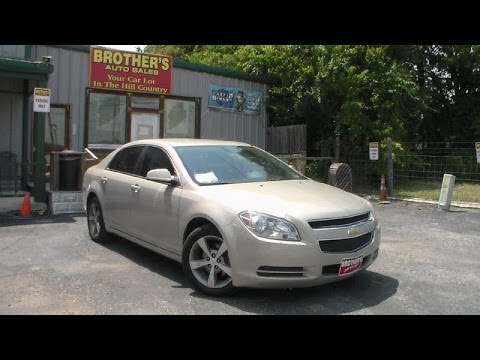 The 2011 Chevrolet Malibu's bold, attractive sheetmetal and stylish interior touches are backed by confident handling, a quiet ride and an overall level of refinement competitive with the category's best. Unlike some competitors, the fuel-efficient four-cylinder engine is available on all Malibu trims, not just the entry-level model. Great for road trips: comfortable, reliable and efficient. I have not had any problems to date and my Malibu has 45k miles on it. The gas mileage is great and the car is comfortable for long road trips. My Malibu is perfect for commuting to and from work. The backseat is big enough to transport my two dogs and 7 year old step daughter. The a/c is always ice cold and heater warm. It has power windows and power locks. It has an AutoStart feature which I love, especially on cold days. I can heat my car from my living room. The trunk is extremely spacious, so my family always takes the Malibu when we go shopping. It fits two large suitcases and a carry on suitcase easily, so it's always the car we take on road trips. We like that its fuel efficient, comfortable and spacious. Another feature I really like is the fact that it stores oil change history and tells me when I am due for an oil change. I can also see how many miles are left before I need to refill my gas tank. The headlights have a feature where you can choose auto lights or manual which I like. The seats are power operated so you can move the seat forward or backward with the push of a button which makes it easy if different drivers of different heights need to switch off driving. This car has been very reliable and I am very happy with my purchase. I do not plan on trading it in or selling anytime soon. 193,000 miles with only 3 non major parts replaced due to wear and tear! I have owned this car since early 2012 and it was used with 39,000 miles on it. Amazed by the car with the 2. 4 liter engine and the power it produced. It has been completely reliable to me with highway and city miles. The car now has 193,000 miles on it with very little repairs. All parts have lasted on this car factory wise except: left wheel hub bearing, exhaust manifold. Of course the tires and brakes and battery have had to be replaced but that is normal wear and tear. This car has been extremely comfortable and still is. Drives like its brand new! Very easy car to maintain. The interior is phenomenal! Has heated seats and automatic air conditioning, leather seats, great stereo and nice steering wheel controls for radio and cruise control. Overall opinion about this car is that it is extremely safe, comfortable and extremely reliable. Will definitely be buying the same car but never of course! Was a Malibu the right choice? It might have been that it was an impulse buy; I got in a wreck with my 2001 Malibu and I knew I liked my 01. I did talk my dealer down a little bit, but I agreed on a car without doing much on a background check and it was overpriced. Since I've had my car over the last 2 or so years I have dealt with its' constant bipolar attitude. It goes through moments of feeling like it does not want to accelerate or maintain speed, during cold weather constantly gets put into limp mode(spelling? ), which is where three separate codes pop off on the dash, and then cuts my power to the engine. This can has proven to be kind of dangerous when doing it on the highway as I cannot reach speeds over 25mph. It is been a nice town car, but with where I live and my particular career it is been slightly unreliable and worries me. GM will notify owners, and dealers will replace the outboard lap anchor mounting bracket and inspect the flexible steel cable, replacing it as necessary, free of charge. Owners received an interim notice on June 16, 2015. A second letter will be mailed when the remedy becomes available. Owners may contact Chevrolet customer service at 1-800-222-1020. GM's number for this recall is 15031. General Motors LLC (GM) is recalling certain 2010-2011 Chevrolet Malibu vehicles. In the event of a crash necessitating deployment of the driver frontal air bag, the air bag inflator may explode due to being overpressurized. If the inflator explodes, sharp metal fragments may strike the driver or other occupants resulting in serious injury or death. GM has notified owners, and dealers will replace the front driver air bag module, free of charge. Interim notices informing owners of the safety risk were mailed February 8, 2019. Owners will receive a second notice when the remedy becomes available, which is expected to be in late March 2019. Owners may contact GM customer service at 1-800-522-9559. GM's number for this recall is N182206630.